That’s right, the Darkness’ brother made his appearance on Supernatural Season 11 Episode 20, but surprise, surprise, we’ve seen him on the show before as Chuck. And while the God and Metatron sit-down was engrossing, Sam and Dean were caught up in facing off against the Darkness’ infection. This was an intense episode to say the least. 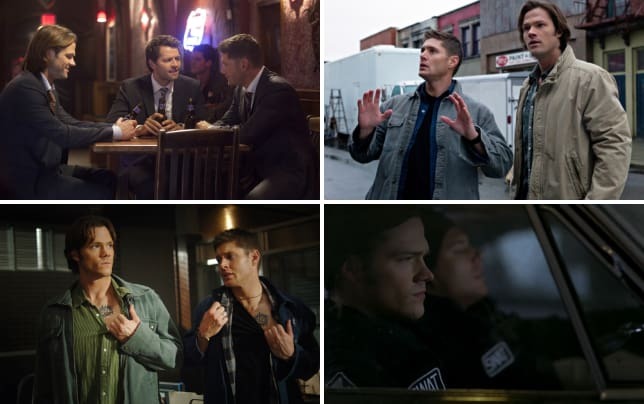 You can bet TV Fanatic staff writers Sean McKenna and Christine Laskodi and The Winchester Family Business’ Alice and Nightsky have plenty to say after that episode! Nightsky: Every scene in this episode was my favorite scene. While going through screen caps for my review, I wanted to choose every freeze frame I saw. I loved this episode! I can pick two lines that stand out, though. Sam's "Dean, quit ironing my shirts with beer!" was priceless and God's "I'm Lennon and McCartney,” which was delivered with perfect humor. Both were great moments. Alice: Just about any scene between Chuck and Metatron. Everything they did was pure gold. But the strongest scene by far was the ending. Good thing Rob Benedict is a musician, huh? There are just no words to describe what that whole “Fare Thee Well” montage did to my emotional state. Also, the amulet is back, and it was in Sam’s pocket! Could that mean Sam picked it out of the trash after all? It was hard to keep it together as a stunned Sam and Dean emerged from the police station with glowing amulet, everyone recovering from the fog, and Chuck was right there in the middle of it. God manned up! He definitely has some explaining to do. Christine: The entire hour! I guess, if I have to be specific, I'll say it's a toss up between Sam telling Dean to stop ironing his shirts with beer or Chuck's rendition of "Dink's Song," which I think I've re-watched at least 10 times. Sean: There were plenty of great moments from this episode, but it was when Metatron broke down and asked why God left before telling him about the goodness in humanity that won me over. It was such a fantastic and emotional moment for his character. And that ending! Yes, there was a lot of good from the hour. Were you surprised Chuck is actually God? Nightsky: Yes. We all imagined it, but I never thought it would be confirmed so blatantly. Having it "revealed" in a blaze of light in the first few minutes of the episode announced in no uncertain terms that this episode was going to be a shocker. Alice: No, because I always believed he was God. I was surprised that they actually went there and confirmed Chuck was God. Man, I thought they would keep us stringing along forever with the hint they left us in “Swan Song.” Six years is a long time you know? God’s sister is destroying the earth, so you know God had to show. Who else could it have been? I think any other choice would have been wrong. Christine: Not even a little! I've always believed in that theory. I was more happy that they were so immediate with it. From the second he appeared on screen with his "Dad" mug, I was like, "YES! THIS IS IT!" And it didn't disappoint at all. Sean: I wouldn’t say surprised by the choice as much as the immediate and definitive answer that Chuck is actually God. I was nervous about the choice, but the more the episode dug in, the more I was pleased with the decision to have it be Chuck. I’m glad we finally get to see God on this show, and I’m excited to see what is next. Nightsky: He was certainly transformed into a sympathetic character. I liked him and was rooting for him to get through to God on behalf of humanity. That's quite an accomplishment for only one episode after years of being the villain. His motivations for destroying the entirety of the host of angels were made clear, but that's a lot to atone for! I believe being human and digging through garbage cans truly humbled him and God is a forgiving God, so there is hope yet for complete redemption. Alice: Oh yes. I was so disappointed when they made Metatron evil after his appearance in “The Great Escapist.” He was so wonderful and benevolent and they made him evil? That never made sense in my book. Being left to fester as a human certainly helped him like it did Castiel. He hit his lowest of low and was given the chance for redemption anyway. I’m glad he felt he could get away with saying all those things to God and not get smited. Probably because he had nothing to lose. I fear that the other writers will just go and screw up his character again, so I’ll just enjoy this gift that writer Robbie Thompson gave us. Christine: I've never liked Metatron, not even a little. But in this episode, he was used so well. It seemed totally perfect that it would be Metatron who brought God out, and that God would have those question and answer sessions with him. And through those scenes, I felt like I finally understood Metatron, too. That character was completely redeemed for me in just one episode. Sean: Definitely. I soon grew tired of his character after a while, but this episode really turned it all around. Not only was redeemed, but we got a bit more about his turn to the dark side. Plus, he was able to get God back into the action. Bravo, Metatron. What did you think of Dean being immune to the infection? Nightsky: That was expected. I wasn't surprised at all, but I'm very curious what Amara's plans are for him. 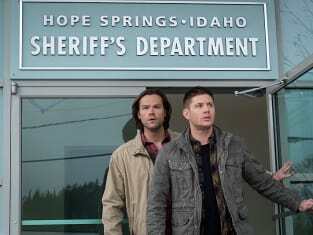 We've been speculating (at The Winchester Family Business) but I'm still curious. I think that's one of the huge revelations awaiting us this season. Alice: I’m not surprised at all. He is bound to Amara, so I would think that he is immune from anything she unleashes on the world. I would have been mad if he was actually overcome the way Sam was. I’m assuming that was a reminder of the prophecy that she and him would be together forever. Even Sam in his fog induced state confessed his belief that Dean will choose Amara over him. It does make you wonder if he actually will. Christine: I wasn't surprised. He's tied to Amara. She's already said that they can't hurt each other. But as Alice pointed out, I really felt for Sam when he told Dean that he knew he would choose Amara, and it made me wonder if that would end up being true. Sean: Yeah, it wasn’t surprising, but it still makes me wonder about the whole connection to the Darkness. I’m hoping there’s some decent payoff there as we head into the finale and the next season. What will God’s role be in the final episodes of Supernatural Season 11? Nightsky: I don't know, and that's what makes it interesting. Alice: I’m not sure, but that heartbroken look on Metatron’s face pretty much said it all, it cannot end well. Chuck/God has never been wrong about what’s on the pages, so now I’m wondering if this show will actually go there and kill God. Why not, they killed Death, who did say in season five that he would reap God one day. I just wonder what this show would do with a Godless universe. There are more seasons to come, so I guess that raises possibilities. Christine: Was it sadness on Metatron's face reading those words? I read it differently. I read it more like, when you read something incredibly beautiful and moving and THAT makes you cry. HOWEVER — there's more seasons to come. I don't think that they'd "kill" Chuck. I feel like after the hit of bringing back Charlie to kill her, doing essentially the same thing to Chuck would just be a complete sucker punch. So I do think that the role Chuck plays won't be a simple, "God defeats the Darkness" story, but I also don't think he's going to die. And if he does, then you can all send boxes of tissues to my doorstep. Sean: It’s awesome that we even get to think about that, but the way that song was sung before God showed up to meet Sam and Dean has me worried God could die. Would Supernatural do that? Guess we’ll be finding out soon enough!